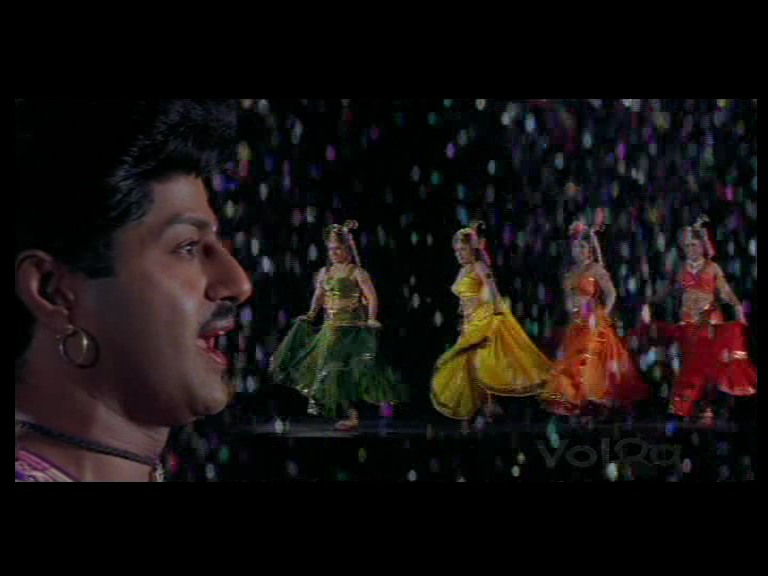 Released in 1994, Bhairava Dweepam is a lavish lolly coloured Telugu folk tale. Writer/director Singeetham Srinivasa Rao picked up a couple of awards and the film was both a commercial and critical success. Although I found it quite entertaining, there are a few things I couldn’t help but compare unfavourably with other similar films. The story is easy to follow, which was handy as I haven’t been able to find subtitles. Vasundhara (K.R Vijaya) had a baby, probably out of wedlock but certainly not to the liking of the royal family. When she takes her son to the prince, the father in question, she is turfed out into the stormy night. She has an accident in her small unstable boat and mother and child are separated. 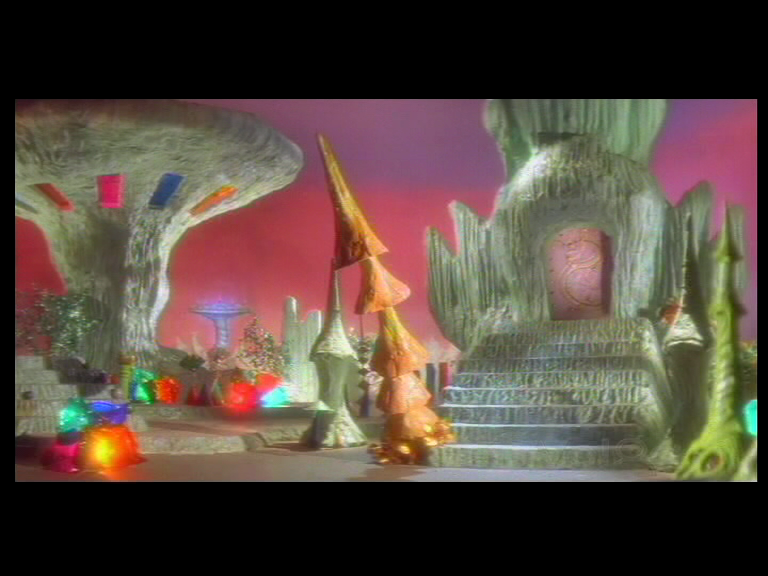 Vasundhara is taken in by a kindly hermit who also creates a magical (poorly trimmed fabric) flower that will thrive as long as her son is also alive. The boy is adopted by a village leader and grows up to be Vijay (Balakrishna). The people rejoiced – except that baby in yellow. 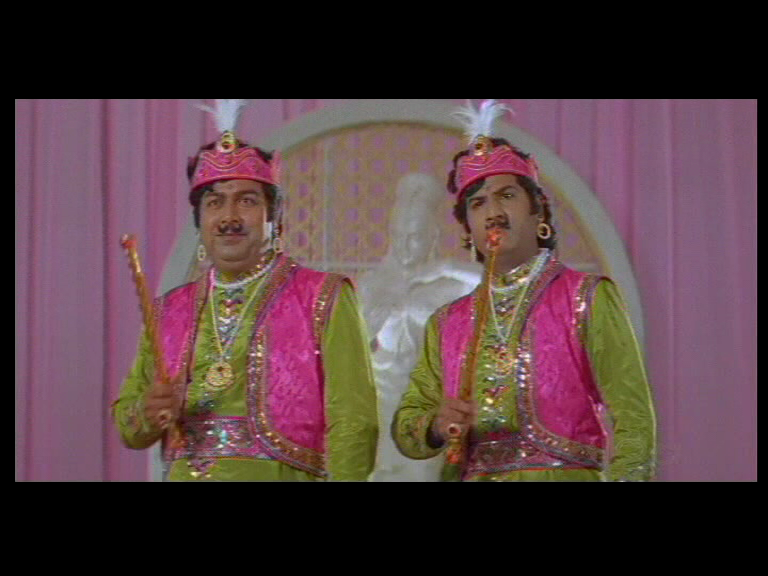 Vijay and his sidekick or adopted brother, (Mohan Babu), are out and about doing what boys in folktales do when they spy Padma (Roja). 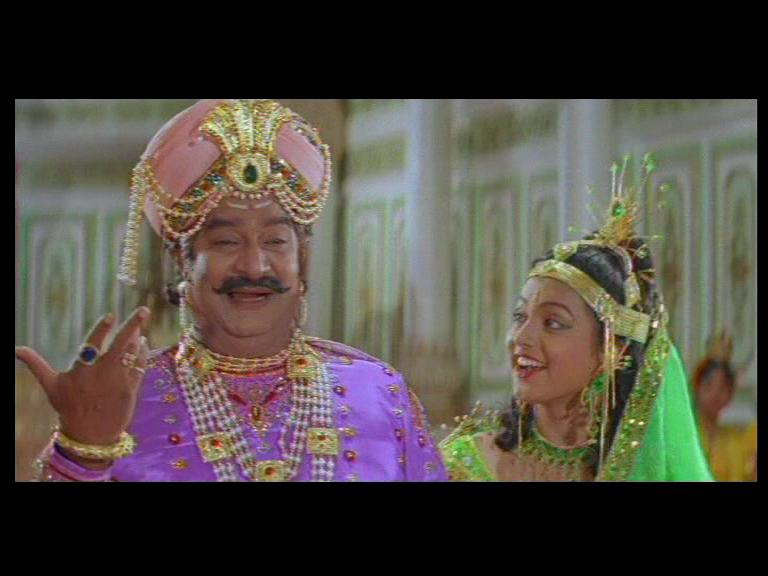 Vijay is instantly smitten and sets about finding his way into the palace to spend more time with her. Unbeknownst to Padma, an evil magician also has his sights set on her. 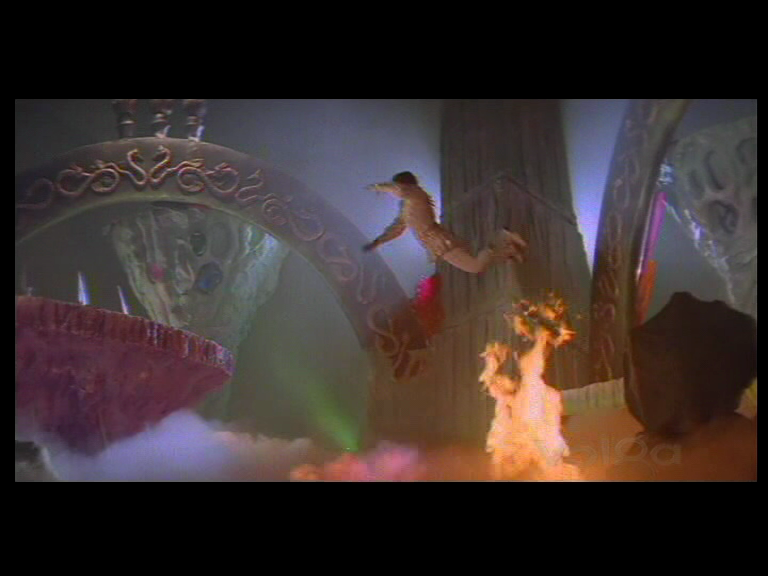 Padma is rendered seriously ill by a spell and Vijay searches for a cure. Along the way he meets his mother but they don’t yet realise their connection. She gives him a protective amulet which comes in very handy. 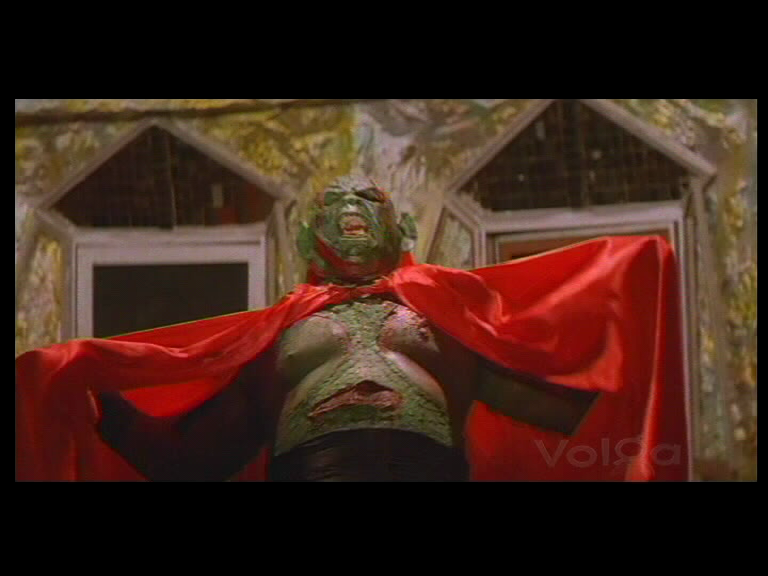 He discovers the nefarious plot and after much travail, confronts Bhairava to set things to rights. The story is very similar to the gorgeous 1951 film, Patala Bhairavi. And that is where the comparisons start. 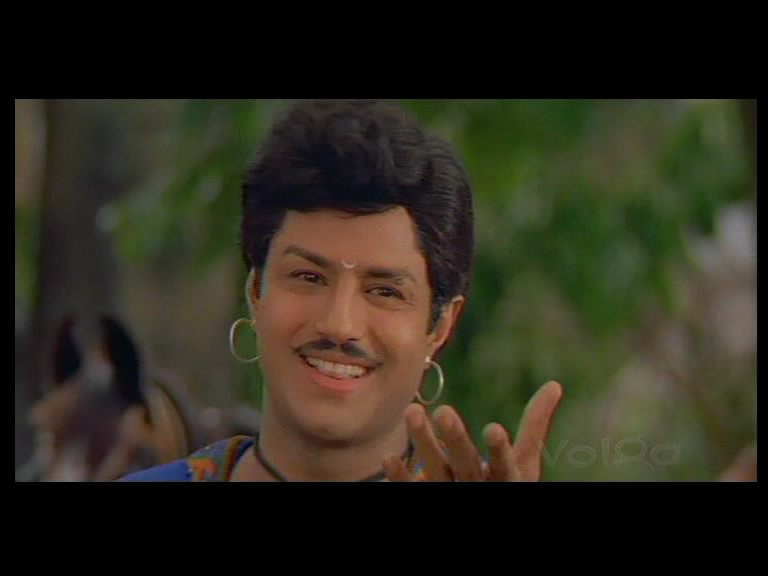 Where Patala Bhairavi was stunning and NTR was effortlessly charismatic, Bhairava Dweepam is a bit less magical and Balakrishna is more workmanlike in constructing his performance. 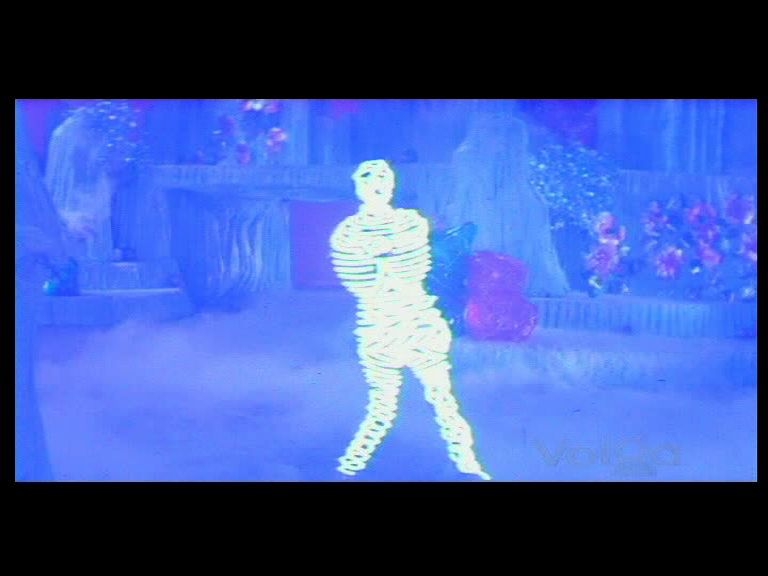 The special effects in 1994 have not moved on all that much from 1951. I did wonder what my 1994 self would have thought, but in 1994 I had already seen films like Ridley Scott’s Legend (1985). 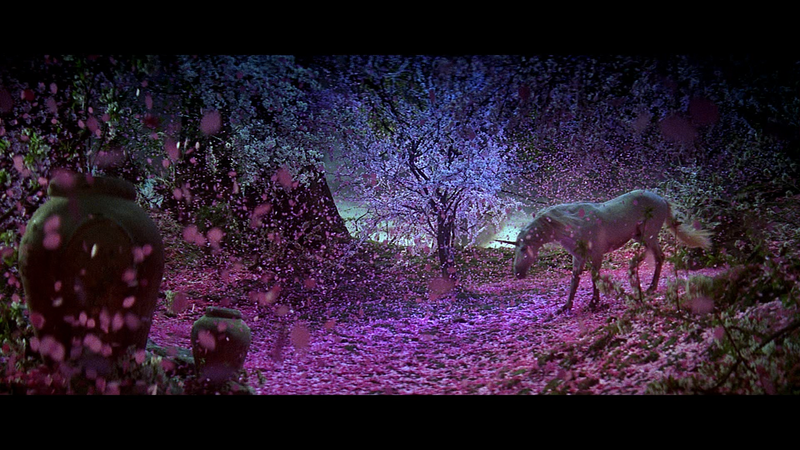 While there were some things about Legend I don’t care for (Tom Cruise for starters), it did look like a magical fairytale and the unicorns are beautiful. Compare and contrast these approaches to prosthetic horse makeup. While I appreciate the spirit of making do, even if it does result in a grumpy looking horse with feathers stuck on, I was left a little underwhelmed. It was a mixed bag and often more amusing than enchanting. 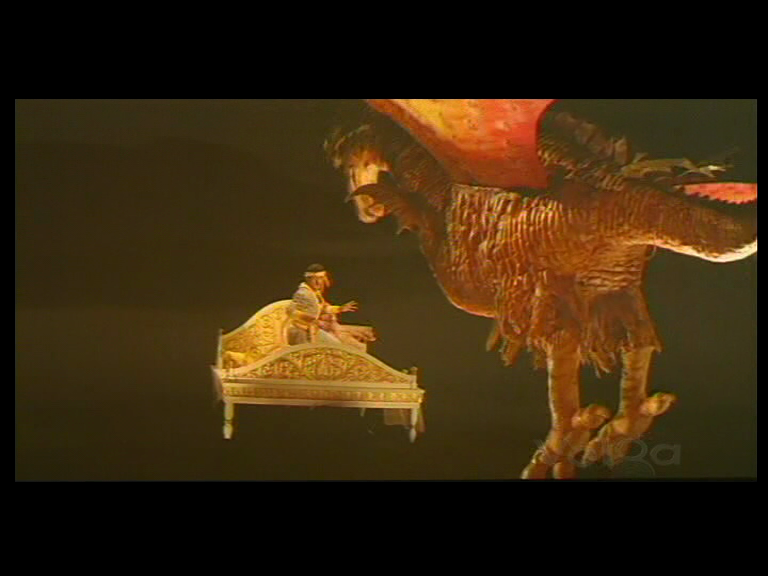 There are other sequences involving a two headed rubber chicken dragon attacking the flying bed used to whisk Padma to the villain’s cave, some tiny miniature people who help Vijay obtain a magical necklace, a mirror monster in a peekaboo green rubber suit and so much more. It is kind of great but not really good. 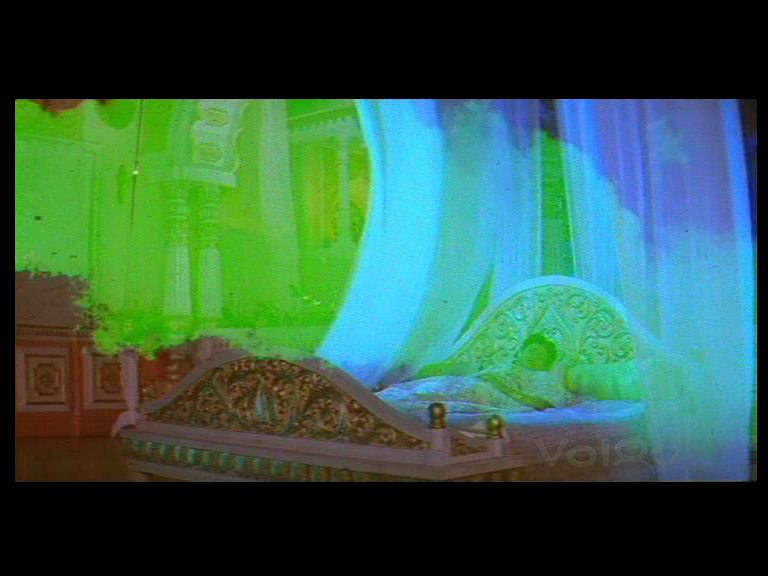 Ajooba-esque, perhaps. And there are some horse stunts that look horrible. 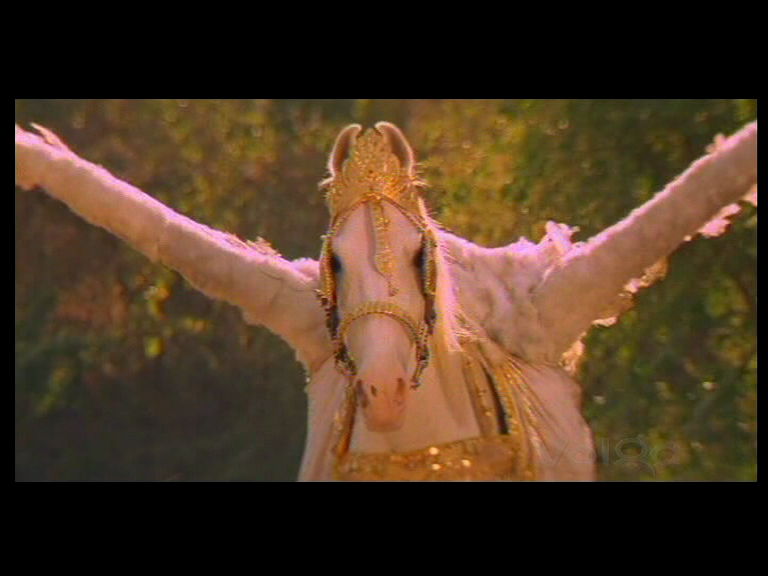 One scene involved Vijay using a stick to trip horses, and not all of them looked like they were going to get up. I deducted Hero points from Vijay on seeing that tactic. Balakrishna works harder than anyone else in the cast. 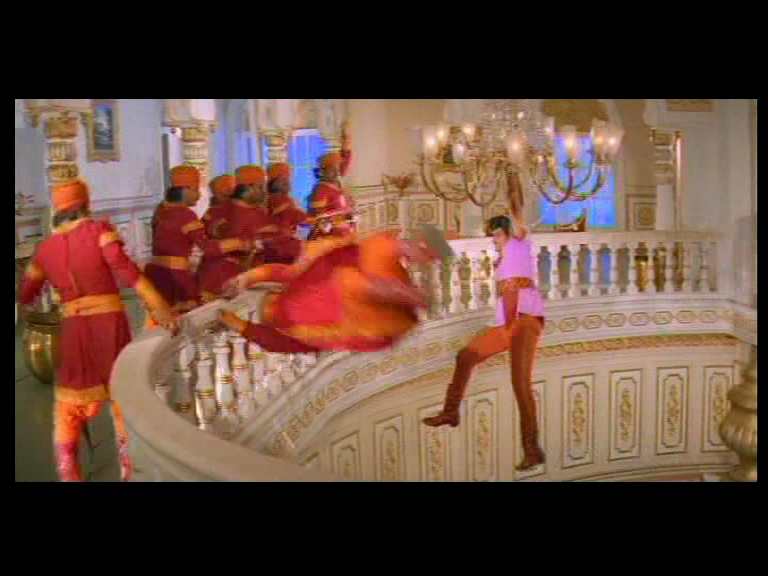 Vijay is in almost every scene and usually throwing himself into a duel or bounding about rescuing the princess so this is a physically demanding role. 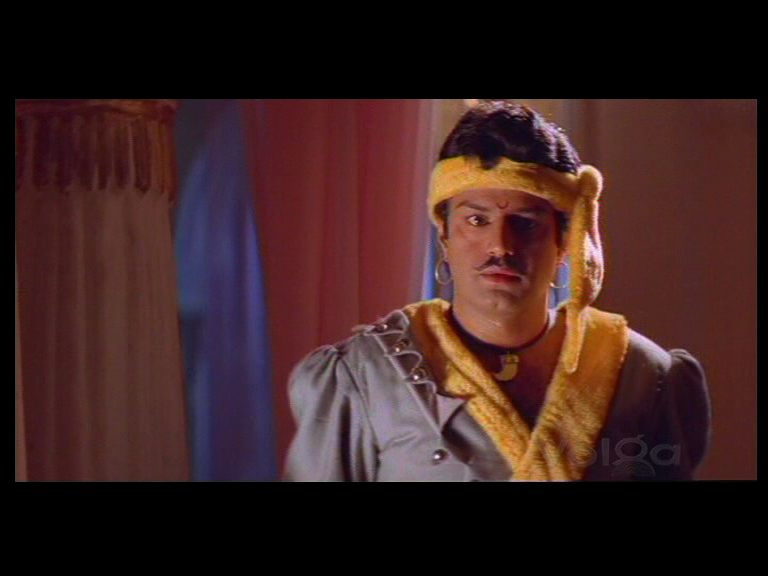 If Balakrishna had been paid per leap he would have cleaned up. 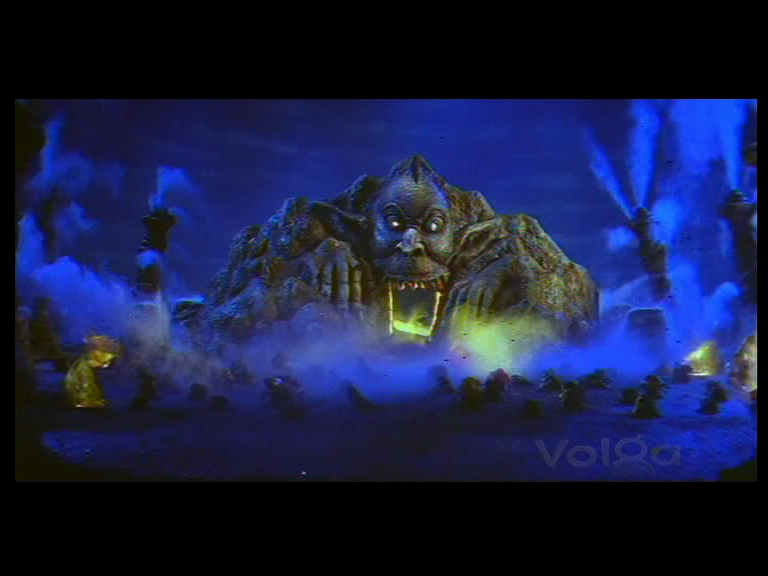 Vijay helps or liberates a number of magical beings along the way, and they give him valuable assistance in his quest. 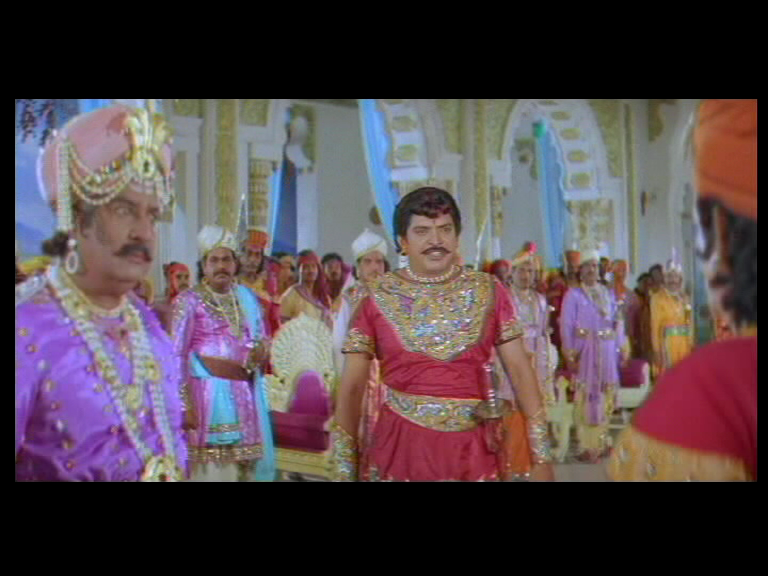 Balakrishna certainly has the confident swagger down pat even if his dancing is less than impressive. But making a film that is so similar to one of NTR’s acclaimed roles and trying to replicate his style is a big ask. I thought the same when I watched Sri Rama Rajyam. There is nothing wrong with his performance, but he doesn’t have the same expressive quality or panache and so comes off as less engaging. Tarak (NTR Jr) seems to take a slightly different tack by paying a tribute to his grandfather in his films but not trying to mimic him as closely. That allows for more individuality and he has developed a kind of everyman hero persona (with phenomenal dancing skills). Balakrishna is more closely tied to the legacy and so I find it hard to appreciate him as an individual actor, at least based on the handful of his films I’ve seen. Plus he will always be This Guy to me. Roja is the love interest, Padma Devi. Padma is your standard damsel in occasional distress. She does nothing other than look sparkly, frolic with her handmaidens and wait to be rescued from Certain Death. 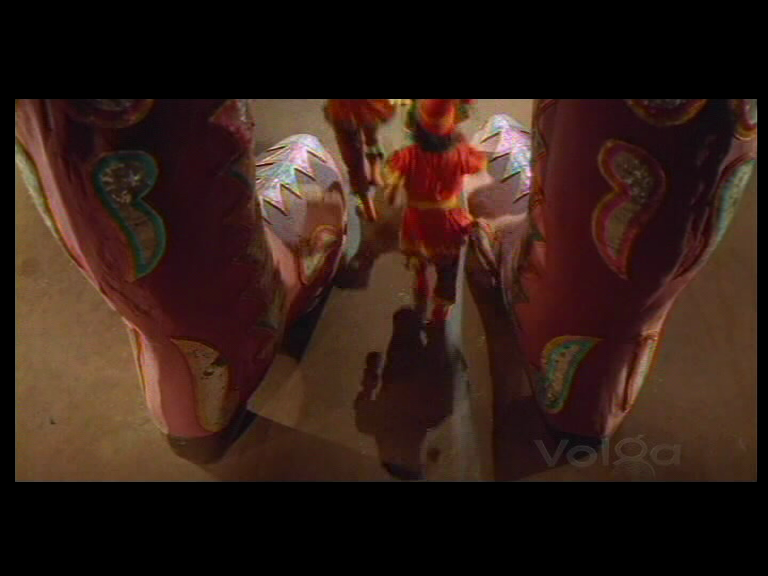 Roja is pretty and lively, and she handles the numerous songs and dances easily. But I think she would have spent more time in hair and makeup than having to learn her few lines. I did wonder why, since Bhairava required a virgin for his spell, no one thought about how Padma could disqualify herself. The supporting cast are all good without being outstanding. 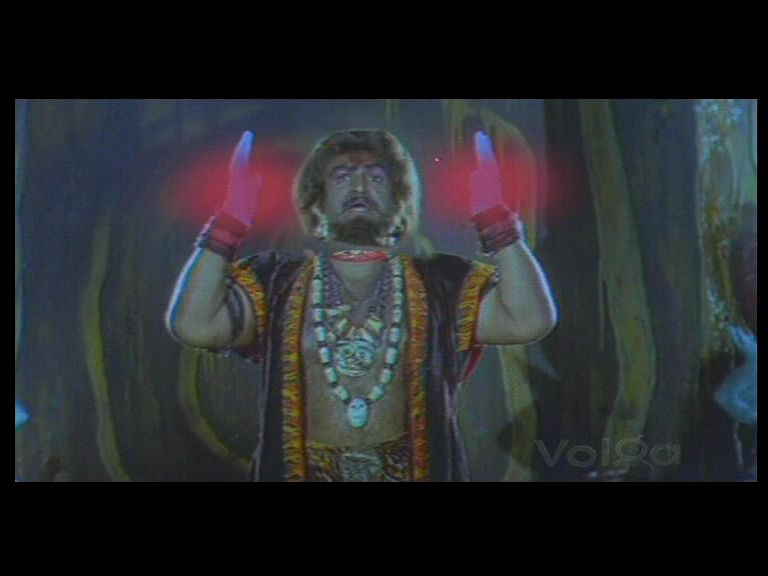 Rambha has one of the big musical numbers as Yakshini, the owner of both magical necklace and green mirror monster. Giri Babu and Subhalekha Sudhakar play scheming brothers (and Vijay’s relatives) who not only depose their own father but have their eye on Padma’s kingdom as well. 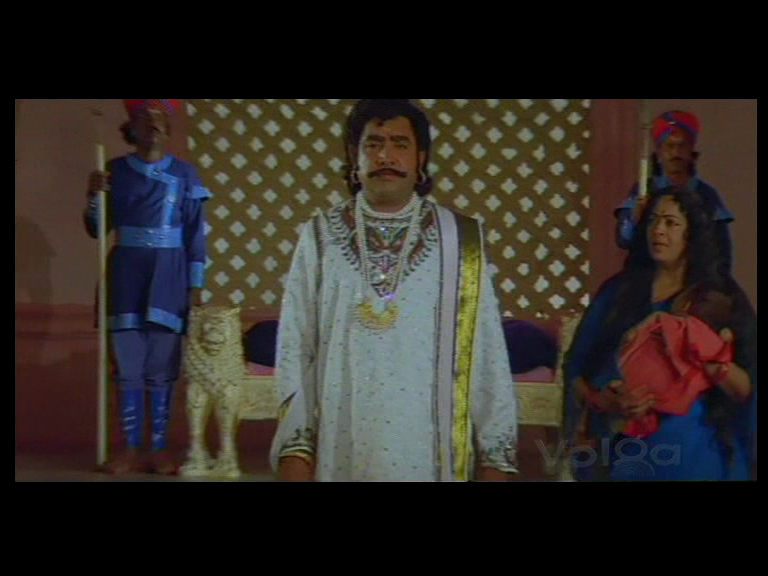 K.R Vijaya is good as Vasundhara and she does get a couple of quite dramatic scenes, including a classic Nahiin Face Off with Balakrishna. The design department certainly went for it. Their philosophy could be summed up as ‘all the colours, all the time’. Vijay has an extensive wardrobe of gaudy leggings and tunics, nicely accessorised with an array of ornate boots and matching wristbands. I was particularly impressed with the outfit that had canary boots to match the yellow terry-towelling trim and headband. Perfect for the active hero! 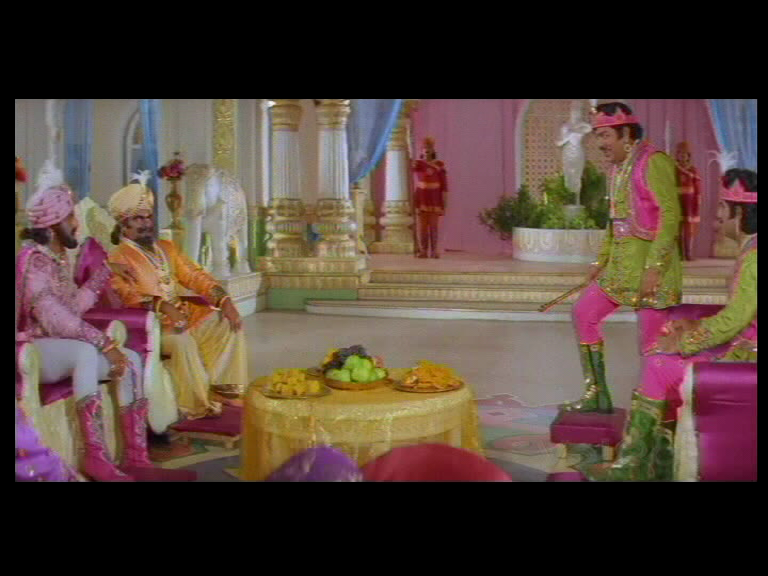 Roja is very glittery, as are her attendants. 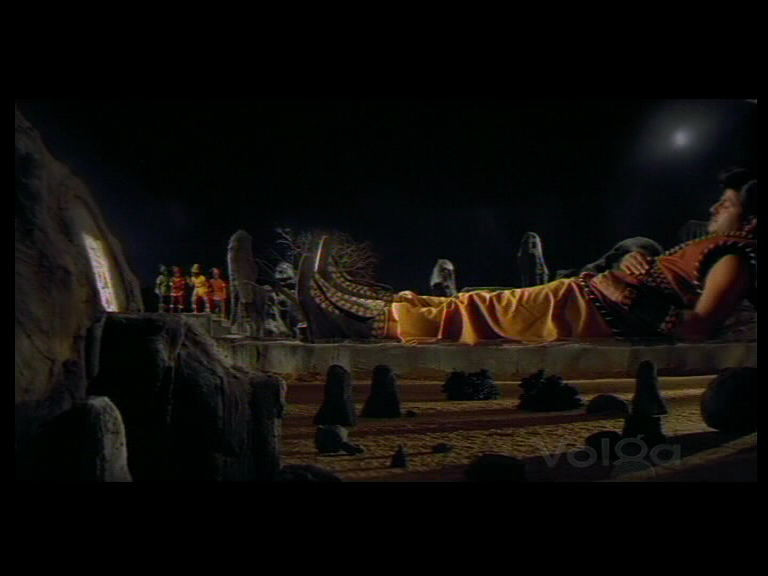 Bhairava’s island cave lair is more impressive from the outside but he does have more than the usual number of talking statues so that was something. 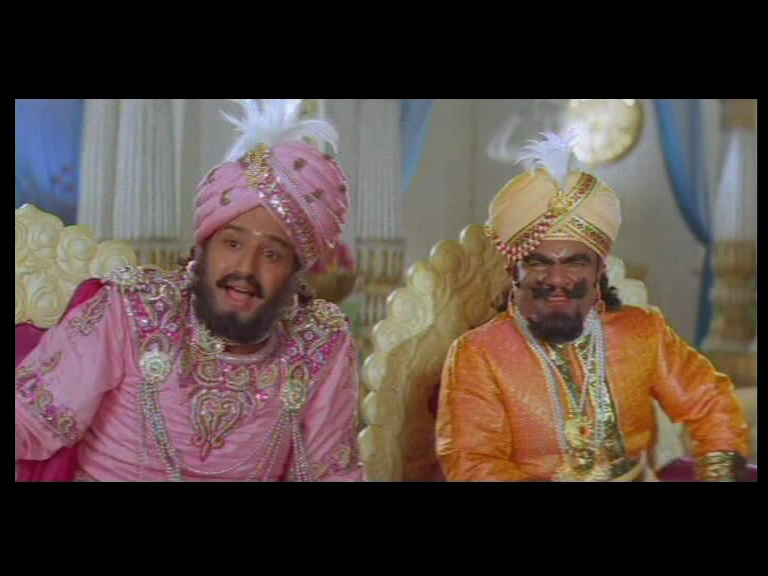 There are comedy demons that help Vijay, and they look like something straight out of the kindergarten dress up box. Also – I love this production house emblem. 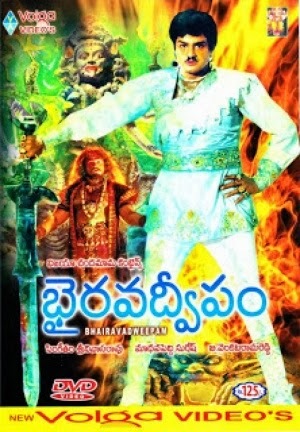 This entry was posted in Tollywood and tagged Adventures without subtitles, Balakrishna, Bhairava Dweepam, Giri Babu, K.R. 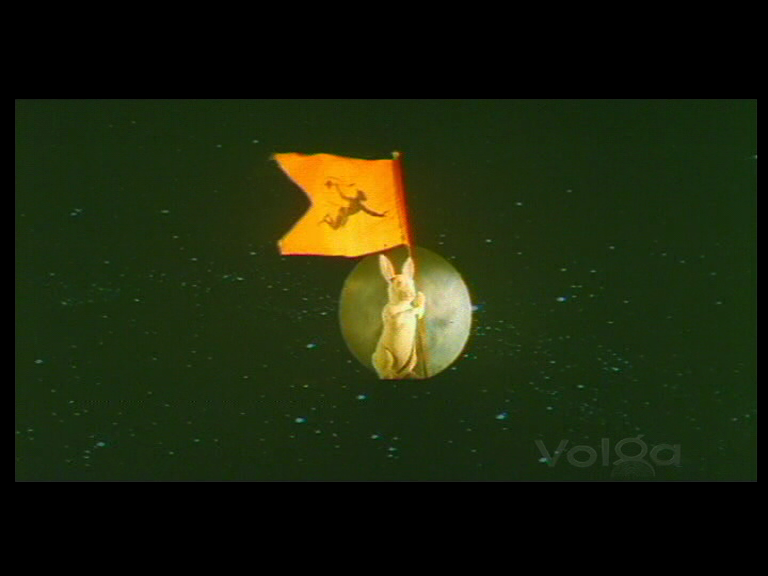 Vijaya, Mohan Babu, Rambha, Roja, Singeetham Srinivasa Rao, Subhalekha Sudhakar, Telugu. Bookmark the permalink. Hey KB 🙂 Yes that is the production house. I might try and track down a copy of the stories. Thanks! Thanks KB. I had a quick look online but as you say, I wasn’t sure if I should start at the beginning or if there were different collections, and if so which one was best. They seem to be different stories but maybe it is one longer story broken up into chapters. Have a great weekend!